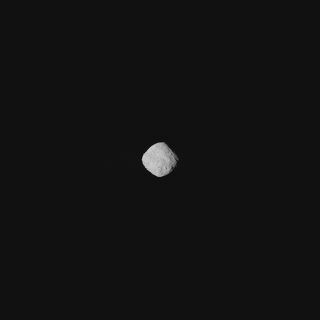 This "super-resolution" view of the near-Earth asteroid Bennu was created using eight photos taken by NASA's OSIRIS-REx spacecraft on Oct. 29, 2018, from a distance of about 205 miles (330 kilometers). The asteroid Bennu is really coming into focus for NASA's approaching OSIRIS-REx spacecraft. OSIRIS-REx snapped eight photos of the 1,650-foot-wide (500 meters) Bennu on Monday (Oct. 29), when the probe was about 205 miles (330 kilometers) away from the space rock. Mission team members combined these images into a single "super-resolution" shot, which reveals boulders and other features on the asteroid's surface. Zoomed-in version of the ”super-resolution" image of the near-Earth asteroid Bennu captured by NASA's OSIRIS-REx spacecraft on Oct. 29, 2018, from a distance of about 205 miles (330 kilometers). If all goes according to plan, the Hayabusa2 mothership will snag samples from Ryugu next year; this material will come down to Earth in a special return capsule in December of 2020. OSIRIS-REx has similar goals; the mission aims to return a Bennu sample to Earth in September of 2023. But OSIRIS-REx needs to get to Bennu first. The spacecraft, which launched in September of 2016, has performed three "final-approach maneuvers" this month to help make that arrival happen. The first two, which occurred on Oct. 1 and Oct. 15 of this year, slowed OSIRIS-REx's speed relative to Bennu by a total of 1,088 mph (1,751 km/h), NASA officials said. The third move, which OSIRIS-REx conducted on Monday (Oct. 29), was designed to slow the probe from 11.7 mph (18.8 km/h) to just 0.24 mph (0.39 km/h) relative to Bennu. A fourth and final such maneuver, scheduled for Nov. 12, "will adjust the spacecraft's trajectory to arrive at a position 12 miles (20 kilometers) from Bennu on Dec. 3," NASA officials wrote in an update Monday. But there will still be a bit of work to do after that; OSIRIS-REx won't enter orbit around the asteroid until Dec. 31. OSIRIS-REx is short for "Origins, Spectral Interpretation, Resource Identification, Security, Regolith Explorer." The $800 million mission's chief goals involve helping researchers better understand the solar system's early days, as well as the role that carbon-rich asteroids such as Bennu may have played in helping life get going on Earth. OSIRIS-REx will also make significant contributions in several other areas, mission team members have said. For example, the mission's observations should shed light on the forces that shape asteroids' paths through space and reveal insights about the resource potential of space rocks. Like Bennu, Ryugu is a carbon-rich asteroid. The Hayabusa2 mission's main objectives align closely with those of OSIRIS-REx.